Editor's note: This is part three of a four-part series describing life within pregnancy care centers. …can be an emotional and spiritual roller-coaster. Each day carries potential for great joy and great loss. Every encounter with a new client brings a unique challenge. There are clients who come once and are never seen again, others who return often for multiple pregnancies; some who listen, accept help, and make life-affirming changes, others who use the system to get what they want. Clients come for pregnancy tests, post-abortion counseling, material help, parenting classes, encouragement, and answers. It’s hoped that each client will be met with compassion, truthful information, and an opportunity to hear about forgiveness and a new life in Jesus Christ. When this truth hits home, there is cause for celebration and deep satisfaction in being part of God’s ministry. Even with its challenges, volunteering at the center is a good way to gain perspective. It offers a different outlook on life and another reason to be thankful. It presents an opportunity to forge a relationship with someone for whom Christ died. It hones listening skills and strengthens a believer’s ability to share the gospel. In the course of a day, a volunteer is involved in situations where their strengths and flaws surface. How will they handle the temptation to judge someone who’s made ungodly choices? It’s a good way to get to know yourself. So who are PCC workers? Are they extraordinary people? spiritual giants? No, they are just sinners, saved by grace, wanting to share the love of Christ, realizing they have been saved to serve, believing that they “can do all things through Christ.” They are people who have their own set of circumstances to deal with, but believe that God is at work through it all to bring His kingdom to earth. Happy Thanksgiving to you all! May God richly bless you for your many hours of service in the cause for Life!!! This is part two of a four-part series of posts presented by Sue Ellen Doenier of Baptists for Life. A day in the life of a Pregnancy Care Center …is never dull. Staff and volunteers often hit the floor running. There are clients with appointments, clients requesting pregnancy tests, and a walk-in client who has run out of diapers or formula and needs some emergency help. The phone rings and someone wants to know if the center performs abortions or will refer for abortion. If the center is short-staffed – which isn’t unusual – demands can become overwhelming. It may even get chaotic! By the end of the day, there may be a stack of client notes that still need to be recorded. Other days unfold in hour after hour of canceled appointments. When this happens, time is spent sorting donations and stocking the EWYL store; catching up on filing; entering client information into the center’s database; writing thank-you notes to donors; reviewing the “big white resources book,” or building relationships with other volunteers and sharing counsel. An urgent call may come in from a woman who doesn’t have a place to spend the night. Volunteers quickly scramble to find a place for which she qualifies, then refer her on. Back in the director’s office, there are other concerns. Will there be enough money this week/month to pay building expenses, salaries, center supplies, and utility bills? What’s the best way to effectively communicate the center’s ministry and needs to area churches whose financial, prayer, and personnel support they so desire? Do they have enough trained volunteers to keep the center open for a sufficient number of hours? And how are the volunteers doing spiritually, emotionally, and physically? Are they working well together? Are they adequately trained? Slick, smooth, polished, professional, put-together, fact-filled, compassionate-sounding, reasonable, understanding, tolerant….oh, they sound so good. They most definitely appear as “angels of light.” But the truth is Planned Parenthood, the abortion-industry’s 1 billion dollar a year giant, is a cunning, deceitful organization, spending all its resources promoting death. And who has been a liar and murderer from the beginning, but Satan himself? While abortions in America have dramatically decreased, PP’s abortions have equally dramatically increased through the same years. The only way to battle Satan is with the power of God and His Truth. As I spoke the simple truth, I reminded myself that it is only the truth that will set people free from lies and I prayed the listeners would have great discernment as they listened. Some will respond to truth; some will not. It is my job, as well as each pro-lifer, to speak the truth in love. Jesus has disarmed the powers and authorities of evil and given us His own Holy Spirit, who fills us with truth, power and courage to defend His littlest ones. http://bfl.org/Files/LifeMatters93print.pdf. The Baptists for Life Organization invites you to copy the pdf. file for use in your own churches. …begins with prayer. Patience, wisdom, love, and courage are requested for their thoughts and actions as well as for the clients God will guide through their doors. Only God knows who they are about to meet. One client may be a nervous 16-year-old girl who is relieved to hear she has a negative pregnancy test. When her advisor explains to her the risks of sexual promiscuity and the blessings of God’s design for marriage, the conversation turns to spiritual issues and she hears the gospel for the first time. She is curious and asks questions. Another client receives a positive pregnancy test and reports that she is going to get an abortion. After the physical, emotional, and spiritual dangers of abortion are presented to her, she agrees to watch a video showing the development of the baby in its first three months. As her understanding is opened, she breaks down and explains that she really didn’t want an abortion but felt unready to care for a child. The advisor shares information about the center’s Earn While You Learn (EWYL) program and the client enrolls. Some clients are referred to the center’s EWYL program through a pediatrician’s office or health clinic. A volunteer explains how they can earn points to buy necessary baby items by attending parenting classes; keeping doctor appointments; attending church or completing Bible studies; watching videos on fetal development, child care, and healthy lifestyle; learning to live responsibly. When conversations turn toward spiritual truth, often it’s revealed that a believing family member, friend, or co-worker has been witnessing to the client and the advisor is given the privilege of leading an open heart to salvation through the Lord Jesus Christ. Baptists for Life is not a PCC – we’re a support organization for PCCs worldwide, producing materials, doing trainings, and serving as a bridge between PCCs and churches through our prayer calendar and by speaking in churches to raise awareness about the fundamental significance of pro-life ministry. Partners in Ministry is a service of Baptists for Life to pregnancy care centers. We host an annual training conference. Our ministry is also involved in end-of-life issues through our LIFT (Loving In Final Transition) ministry, providing training to caregivers of the terminally or chronically ill. Our website is www.bfl.org. See how doctors, including Care Net's Sandy Christiansen, use their medical skills to protect the sanctity of human life. 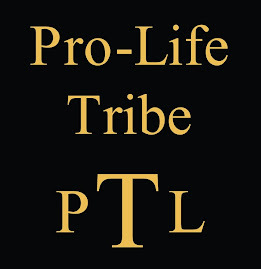 Pro-Life Tribe welcomes Guest Blogger Jim Stair reporting on his participation in a recent Life Chain event in Portland, Oregon. For more about Life Chain, go to http://www.lifechain.net. Sunday was really interesting. I picked up one of the "Abortion Kills Children" signs from one of the organizers and found a spot down the side-walk to stand. The chain-link fence that was there a year ago when the PP ground breaking was going on was still up, so no one could stand there. Soon there were several others standing in the same vicinity I was. The proprietor of the store that happened to be behind us came out and asked us to move along, because she thought we were blocking her business. I told her that the event was only once a year and that we were only going to be there a couple of hours. Her reply was "a couple of hours is a couple of hours." Anyway, I decided to move instead of fume, and found a better place to show my sign at a major intersection so traffic going four ways could see the sign rather than just two. That spot really evoked a lot of reactions. One "lady" (I'm being kind) dressed in a mini-skirt and mesh stockings came by, screeming at the top of her lungs as she walked, "It's my body and my life! It's my body and my life!" until she was clear down a side street. I had been taking some pictures with my cell phone camera, but she startled me so much I never got her picture except in the shadows in the distance. It's proably just as well. Another woman with a pit bull was arguing vociferously with some pro-lifers across the street from me. I am glad the dog was less offended than she was. My guess is that there were over a hundred people paricipating in the Life Chain, mostly Catholics from the neighborhood. Donis was housebound much of the time, but she found a way to express her pro-life beliefs through prayer. Not only did she pray fervently for the clients of the crisis pregnancy centers (cpc), but also she headed up a group of women who prayed for CPC clients and their babies. Once a week, on Friday mornings, the center director would call Donis with a listing of prayer needs (names changed to protect anonymity). Donis would then pass on those needs and by the end of the morning each client need was covered in prayer. Only God knows how many women chose life because of the effectual fervent prayers of a band of godly women. While we are on the subject of senior citizens demonstrating their commitment to the sanctity of human life, let me tell you about two more pro-life heroes: Helen and Rosemary. Rosemary has gone on to receive her reward but, while on earth, she showed love and compassion for babies by making over 5,000 pairs of booties to give to clients of crisis pregnancy centers. We won't know this side of heaven how many women chose life because of Rosemary--a total stranger who showed love for the babies they might have aborted. At 91 years of age, Helen lives in a retirement center and maintains an active life. When she's not walking or participating in her daily exercise class, she's at her sewing machine crafting hundreds of baby blankets from material donated by women in her church. When she tires of that, she crochets beautiful baby blankets--all to give to clients of crisis pregnancy centers. When a woman is in a state of indecision about her pregnancy, a lovely handmade item crafted just for her and her baby, can sometimes help her to see hope beyond her fears. Tell us about a pro-life hero you know.